Giorgio Blundo & Pierre-Yves Le Meur (eds. 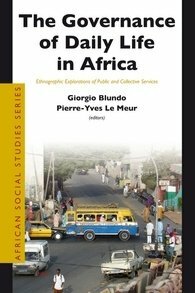 ), 2009, The Governance of Daily Life in Africa: Ethnographic Explorations of Public and Collective Services, Brill Academic Pub. Anchored in an empirically-grounded anthropology, this book explores the notion of governance in a non-normative way. It describes and analyses the institutional and political processes through which social actors and groups – be they state, private or « third-sector » – contribute to the provision of public and collective goods or services. The book draws on case studies from Anglophone and Francophone Africa, crossing anthropological traditions that have too often evolved in parallel directions and dealing with a range of topics such as health, water supply, sanitation and waste management, security, humanitarian aid, land issues and decentralisation. Beyond African boundaries, it contributes to current debates about governmentality, public policy, subject making, public/private boundaries, and the role of the state.